• Polished 18K Rose Gold case. • Beautiful Hand Engraved (engine-turned) black dial. • Applied Rose Gold Roman Numeral Hour Markers on a silver chapter ring. 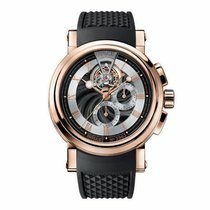 • Rose Gold "Breguet" Style Hands with Luminous tips. • Chronograph: Small 12 hour counter sub-dial at the 6 o'clock position. Minute counter sub-dial at the 3 o'clock & Central Seconds counter. • Tourbillon carriage at the 12 o'clock - doubles as the seconds hand. • Breguet Caliber 554.3, contains 28 Jewels & has an approximate Power Reserve of 50 hours.